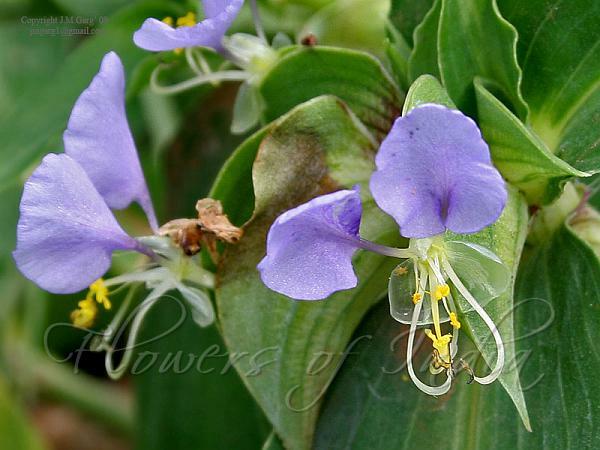 Spotted Dayflower is a perennial herb. Stems are rising or creeping, branched, glabrous or sparsely hispidulous throughout or in a line. Leaf sheaths are brown, white, or yellow ciliate at mouth, glabrous elsewhere or hairy in a line on 1 side. Leaf blade is ovate-lanceolate or lanceolate, 4-10 × 1.5-2.5 cm, velvety on both surfaces. Involucral bracts are 2 or 3, forming heads at the tip of branches, stalkless or with stalks less than 5 mm, funnel-shaped, 1.5-2 cm, hairless or sparsely multicellular hispid. Proximal margins are joined togethere, tip is shortly pointed. Cincinni arise with 3 or 4(or several) flowers slightly exserted only at anthesis and included in fruit. Flower stalks are about 3 mm. Sepals are 4 mm, membranous. Petals are blue, 2 anterior ones to 1 cm, posterior one 4 mm. Capsule globose, trigonous, ca. 4 mm, 3-valved, or 2-valved by abortion of 1 ovule. Seeds 1 per valve, gray-black, ellipsoid, ca. 3 mm, slightly flattened, subsmooth. 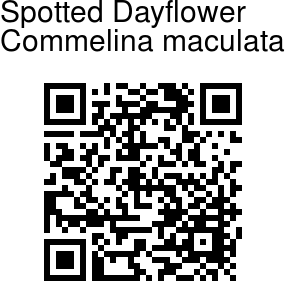 Spotted Dayflower is found in humid forest margins, grasslands, roadsides, ditches, near sea level to 2900 m. Flowering: June-August. Photographed in Pocharam, Distt. Medak, Andhra Pradesh.